Even more fundamentally, I question whether a bodily resurrection of Christ was part of the original gospel. The author of verses 3-11 is especially solicitous to underline that it was. But, as we saw in post 7, Philippians 2 contains a very early Christian hymn that doesn’t say a word about such a resurrection. It has the descent of a pre-existent divine Son, and his taking on of at least the appearance of humanity, and the humbling of himself unto death “even death on a cross” (Phil. 2:8), and an exaltation that included the conferral of a new name on him by his Father. But there is no bodily resurrection in the hymn. And that is the case too in the S/L2 version of the Vision of Isaiah. Not a word about a resurrection of the Beloved Son’s body, but plenty about his rising back to his Father in heaven. In the Vision of Isaiah the Son, even in death, as a divine figure, after crucifixion, continues on his way under his own divine steam. He does not need the Father to raise him from the dead. If, as I hold, the source of Paul’s gospel was the Vision of Isaiah, there are other reasons to think that he would not have subscribed to the gospel summary we find at the beginning of 1 Corinthians 15. The Christ of this latter passage dies as a man, not just as the appearance of one, and so after his death he needs to be raised from the dead by his Father. In contrast, the Vision of Isaiah presents the Son—even in death—as a divine figure who, after crucifixion, continues on his way under his own divine steam. He does not need or receive the Father’s intervention to complete his mission. He is rewarded by his Father with an increase of glory, but he is not “raised” from the dead by him. The Son’s rising is active, as in 1 Thess. 4:14 (anestē). There is not a word about atonement for sin in the Vision of Isaiah or in the Philippians 2 hymn. The Son’s mission was to destroy spirit powers. Human sin was not a factor. Christ died for our sins (1 Cor. 15:3). If Christ has not been raised… you are still in your sins (1 Cor. 15:17). But there is not a word about any kind of atonement or expiation in any of the versions of the Vision of Isaiah, or in the Philippians 2 hymn, for that matter. There is not the least hint in these early writings that the purpose of the Son’s mission was to free us from our sins. In these it looks like the purpose was to subdue or destroy unruly lower spirit powers, but there is no indication given that human sin was the cause of our subjection to these spirits. So my suspicion is that 15:3-11 is a ruse, a set-up. The interpolator is in effect saying: “Let’s take as our starting point this gospel summary. I assure you that it accurately reflects the gospel beliefs of the first Christians. Let’s work with it and work out all its implications, including what it implies about a resurrection of the dead.” But the proffered starting point, I suspect, is bogus. Some of it may reflect the beliefs of the Revelation community, but I doubt it accurately reflects the beliefs of the original author of the letter (Simon/Paul) and his churches. Most likely it articulates the beliefs that the second-century proto-orthodox interpolator wanted to put into circulation as the authentic gospel. My Simonian hypothesis can offer an interesting alternative: The extensive defense of resurrection that we find in chapter 15 would be the work of the proto-orthodox interpolator. The Apostle had taught that they were going to be changed, but that change was not going to entail any inferior bodily preservation or resurrection. In this scenario the Apostle had not neglected to instruct his flock about the nature of their future existence. He had taught them that they were going to be changed (v. 51), but the change was not going to entail any bodily preservation or resurrection. Verse 50 excludes flesh and blood bodies from the kingdom of God not for any reason related to sin, but simply on the basis of their radical inferiority. Since they are perishable they are unfit for the kingdom of God. I see no reason why this could not have been part of the gospel message preached by Simon/Paul if, as I proposed in posts 7-9, the Vision of Isaiah was the source of his gospel. Saying 1: Flesh and blood cannot inherit the kingdom of God. 1. Now I make known to you, brothers, the gospel I preached to you, which you received, in which you stand, 2. by which you are saved, if you hold fast the saying (word) I preached to you — unless you believed in vain. 50. What I say, brothers, is this: flesh and blood cannot inherit the kingdom of God, nor does the perishable inherit the imperishable. Saying 2: Death is swallowed up in victory. Then I saw thrones, and seated on them were those to whom judgment was committed. I also saw the souls of those who had been beheaded for their testimony to Jesus and for the word of God [and those who had not worshipped the beast or its image and had not received its mark on their foreheads or their hands]. They lived and reigned with Christ a thousand years. The rest of the dead did not live again until the thousand years were ended. This is the first resurrection. Blessed and holy is he who has part in the first resurrection. Over these the second death has no power; but they shall be priests of God and of Christ, and shall reign with him a thousand years. This scenario — competitors preaching visions of a kingdom of God in this world — would explain why Simon/Paul uses revelational language. If this revelation of a kingdom on earth was what Simon/Paul was up against, it would explain why he uses revelational language to dismiss it. He tells the Corinthians that he “makes known” (1 Cor. 15:1) to them something he had already preached to them. He tells them “a mystery” (1 Cor. 15:51). And since he hardly develops that mystery much further here, it was again apparently a mystery he had already revealed to them. In other words, Simon/Paul is admonishing his flock to hold fast to the revelation and mystery he has already preached to them. They should ignore any supposed revelations and mysteries that conflict with his. The vision in Rev. 20:4-6 would qualify as one of these, for it prophesies a kingdom of God in this world. And at least some of its members were to be people who resurrected from the dead. Belief in such a kingdom and resurrection Simon/Paul could not accept. Wasn’t this very notion ruled out as impossible in v. 50? It is indeed strange to see what looks like an emphatic assertion in verse 50 emptied of its force just three verses later. Why didn’t the Apostle just say straight up that flesh and blood can put on immortality and inherit the kingdom of God? That the perishable, by clothing itself with imperishability, can inherit the imperishable? Verse 53 is an odd way to develop the thought of verse 50. The idea of some kind of imperishable, immortal cloak that will make the body imperishable and immortal looks more like the forced correction of verse 50 than a further development of it. It looks like a zag. It also seems to imply that the earthly was made by hands (indicating inferiority). But whose hands made the man’s earthly body? Here one house or tent (body) is clearly not being superimposed on another. The earthly one is destroyed and the heavenly one awaits in heaven. There is exchange, not superimposition. One’s earthly body is exchanged for some kind of heavenly covering. It also seems to be implied that the earthly, in contrast to the heavenly, was “made by hands” and that this is indicative of its inferiority. But whose hands made the man’s earthly body? According to Genesis, it was the maker of the world who formed man from the dust of the earth. Thus this belittlement of earthly bodies apparently belittles too the hands of the god who made them. This fits what we know about Simon of Samaria’s teaching, but is totally out of step with that of the proto-orthodox. We will all be changed (allagesomētha). It looks as if the interpolator has taken belief in a heavenly replacement covering and changed it into belief in a heavenly overcoat for the earthly body. Thus it looks to me as if the interpolator has taken belief in a heavenly replacement covering and changed it into belief in a heavenly overcoat for the earthly body. For him the heavenly will not replace the earthly; it will cover it and thereby give it imperishability. It will turn the perishable earthly body into the imperishable spiritual one he described in 15:42-49.
a highly abstract phrase, neither clear nor direct, but certainly mysterious, just as he (Paul) claimed it would be. Obviously what he wants to say is not simple. He is struggling to describe it. (p. 138). Otherwise, it is hard to explain why Paul doesn’t just say “this mortal body becomes immortal.” If that is what he meant, surely that is what he would have said. But he didn’t. (p. 138). What I am proposing is that Paul was not the one who was struggling to express himself. It was the interpolator who, by choosing to retain the Apostle’s denial of resurrection (v. 50), caused the awkwardness of the argument. His retention of the verse did not allow him to just say “this mortal body becomes immortal.” He had to devise a “correction” (v. 53) that somehow took in the offensive assertion. This way of correcting a text can be awkward but it does have advantages. Interpolation in some ways can be more effective the more it retains of the original. It will give the doctored passage a greater ring of familiarity. And it allows one to generously concede the existence of the offensive reading and just contest its meaning: “Yes, I totally agree that Paul said such-and such (the original passage). But he also said this (the interpolation). The former should be interpreted in the light of the latter.” If someone points out that the text he uses doesn’t have everything that is in yours, you tell him to stop using a version that has been mutilated by heretics. Paul probably believed in a two-body doctrine of resurrection, wherein those who sleep in Christ will be given at the last trumpet entirely new bodies to live in, and not their same old bodies reconstituted (p. 154). But, as mentioned, he doesn’t entertain the possibility that verses 50 and 53 of 1 Corinthians 15 could have different authors or, in general, that the Pauline letters could have been systematically interpolated. 1. Now I make known to you, brothers, the gospel I preached to you, which you received, in which you stand, 2. by which you are saved, if you hold fast the saying I preached to you — unless you believed in vain. 50. What I say, brothers, is this: flesh and blood cannot inherit the kingdom of God, nor does the perishable inherit the imperishable. 51. Listen, I tell you a mystery. We will not all die, but we will all be changed, 52. in a moment (atomus), in the twinkling of an eye. 54. Then will come to pass the saying that is written: “Death is swallowed up in victory.” 55. “O death, where is your victory? O death, where is your sting?” 56. The sting of death is sin, and the power of sin is the Law. 57. But thanks be to God, who gives us the victory through our Lord Jesus Christ. 58. Therefore, my beloved brothers, be steadfast, immovable, always abounding in the work of the Lord, knowing that in the Lord your labor is not in vain. In this reconstruction there is no resurrection of the dead. The faithful will undergo a change, but it does not involve preservation, resurrection or transformation of their flesh and blood. Instead, they exchange their perishable component for an imperishable one. And death’s defeat consists not in resurrection, but in the fact that “we will not all die.” Those alive when this world passes away will be victorious over death, for they will be changed without dying. 1. Now I make known to you, brothers, the gospel I preached to you, which you received, in which you stand, 2. by which you are saved, if you hold fast the saying I preached to you — unless you believed in vain. [verses 3-49, a defense of resurrection] 50. What I say, brothers, is this: flesh and blood cannot inherit the kingdom of God, nor does the perishable inherit the imperishable. 51. Listen, I tell you a mystery. We will not all die, but we will all be changed, 52. in a moment, in the twinkling of an eye. [at the last trumpet. For the trumpet will sound, and the dead will be raised imperishable, and we shall be changed. 53. For this perishable must put on the imperishable, and this mortal must put on the immortal. 54. And when the perishable puts on the imperishable, and the mortal puts on the immortal,] Then will come to pass the saying that is written: “Death is swallowed up in victory.” 55. “O death, where is your victory? O death, where is your sting?” 56. The sting of death is sin, and the power of sin is the Law. 57. But thanks be to God, who gives us the victory through our Lord Jesus Christ. 58. Therefore, my beloved brothers, be steadfast, immovable, always abounding in the work of the Lord, knowing that in the Lord your labor is not in vain. “At the last trumpet” implies there will be other trumpet warnings preceding it. The sounding of the last trumpet has been tacked on and could show . . . another point of contact with the Revelation oracles. The phrase “at the last trumpet” in v. 52 does not sit comfortably next to the words “in a moment, in the twinkling of an eye.” These latter phrases point to the quick and unexpected nature of the event, but “at the last trumpet” implies there will be other trumpet warnings preceding it. There shall be no more delay. In the days of the voice of the seventh angel, when he begins to sound the trumpet, the mystery of God will be completed, as he declared to his slaves, the prophets (Rev. 10:7). 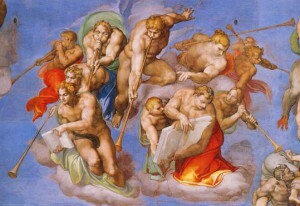 Then the seventh angel blew his trumpet. There were loud voices in heaven, saying, ‘The kingdom of the world now belongs to our Lord and to his Anointed (Christ), and he will reign forever and ever’ (Rev. 11:15). That victory will be followed by the first resurrection. Those resurrected will reign with Christ for a thousand years (Rev. 20:5) and death will no longer have power over them (Rev. 20:6). Afterwards, at the end of the end, there will be another battle (Rev. 20:7-9), another defeat of death (Rev. 20:14), another resurrection (for the dead who were not part of the first one), and a judgment (Rev. 20:12). The reign in this passage too, although compatible with the Revelation post-parousia scenario, is ambiguous enough that many scholars deny it has anything to do with it. There are just not enough specifics, they say, to justify interpreting either this passage or 1 Cor. 15:52 in the light of Revelation. I would agree if we were only considering chapter 15 in isolation from the rest of the Corinthian correspondence. But as I pointed out in the previous post, in the letters there are other indications that the wisdom dealt with by the Apostle at Corinth was related to Revelation’s oracles and that the interpolator was aware of the situation. Do not be deceived (1 Cor. 6:9). The interpolator has again arranged to make his new Paul correct and ridicule the old one. A (hypothetical?) individual, in response to questions he asks, is immediately called a “fool” (15:36). That doesn’t seem an appropriate response to sincere questions. So perhaps his questions should be understood as dismissive and mocking, something along the lines of: “How can you possibly think that the dead are going to be raised? With what kind of miserable body do you imagine they will be clothed?” The questioner’s presupposition would be that any bodies that have anything to do with the bodies of this sad world would necessarily be wretched. Almost certainly lurking behind that denial is a view of the material order that found the resurrection of material bodies (or dead corpses) to be a doctrine most foul (The First Epistle to the Corinthians, p. 775). And if that is the context, the epithet “Fool” should be understood in the Old Testament sense, as someone who does not have correct knowledge of the God of the Old Testament. The fool in question doesn’t have correct knowledge of the God who made this world. He doesn’t understand that the Maker gives “a body as he pleased” (15:38). Simon/Paul, I submit, is the fool that the interpolator had in mind. The interpolator has again arranged to make his new Paul correct and ridicule the old one. Posted on 2014-07-17 20:41:02 GMT+0000 by Roger Parvus. This entry was posted in Paul and His Letters, Roger Parvus, Simonian Origins and tagged Pauline Epistles, Simon Magus. Bookmark the permalink. Fascinating as always, Roger, thank you. Reading about reconstructions of Marcion’s Apostolikon today, it is striking that even Marcion’s texts, which indeed seem to be more original in places than the canonical versions, contain material that he struggled to reconcile with his theology. Which suggests either that he was wrong in his interpretation of them, or else that he was broadly right but they had already suffered interpolations, such as those you suggest. In that case, there can be no question of reconstructing the original text from documentary witnesses, but only by hypothetically teasing apart zigs and zags from even older edit-wars. It is bracing to read your ideas as you put together the pieces of your theory, and it heartens me to think that you might be right, and we really can see past not one, but two heavy campaigns of orthodox textual corruption. Yes, I am skeptical that, even if an authentic copy of Marcion’s Apostolikon was found today, if would be of much help determining the original text of the letters. As you know, I think that the original letter collection was Simonian and that the only public version of it in circulation in Marcion’s time was one that had already been systematically interpolated by a proto-orthodox Christian. Marcion had learned and was convinced that the letters had been interpolated, but I don’t think he ever obtained an undoctored copy. That would be why the work he and subsequent Marcionites did to restore the text apparently went on for years. If they thought they had an accurate copy of the originals such ongoing restoration would have been unnecessary. Marcion apparently based his restoration of the texts on his understanding of the nature of the conflict between Paul and his opponents. So in large part his results would have depended on his grasp of that controversy. Some time (50-60 years) had passed and the splintering of the early churches had already progressed significantly by the time Marcion came on the scene. And it appears that Marcion was not himself Simonian. He would also have been influenced by the gospels being written which now featured a Christ who had a public ministry. If I am right that the source of Simon/Paul’s gospel was the Vision of Isaiah, that is something that Marcion likely knew nothing about. These are some of the things that would have had a bearing on his reconstruction of the text of the Pauline letters. Great article as always. I can agree that Paul was the mask of Simon (Or vice versa!). While I am not able to confidently peel back the Marcionite text (already a reconstruction from the heresiologists) to an alleged Simonian original, I enjoy reading you do it! 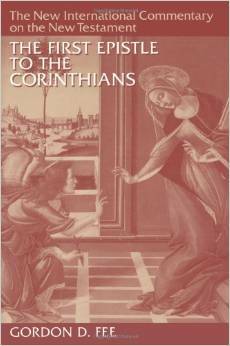 There is a handy reconstruction of Marcionite 1 Corinthians by Stuart G. Waugh on Radikal Kritik, http://www.radikalkritik.de/1CoMR_Waugh.pdf. But I think S.Waugh perhaps includes too much. There is no sufficient reason to assume that Adamamtius 5:6 is quoting the Apostilicon. We follow Tertullian AM 3.8.5 for the preaching that Christ died, was buried, and arose on the third day. As you say, it is hard to know what reading was in Marcion’s Apostolikon. But even if Waugh’s reconstruction of it is correct, I would still question whether it accurately reflects what Paul(/Simon?) wrote. Please see the fourth post in this series and my response to EmmaZunz above. Clearly the Bible is conflicted about many things. Including the nature of any resurrection. Is the resurrection bodily, or spiritual/metaphorical? Eventually the Church it seems, tried to waffle between these two views. Without giving in entirely to spiritual metaphoricalization. And when the Bible was edited or “redacted,” it was edited in such a way as to try to allow either reading. Was bodily resurrection entirely original, or favored? Note that even 1 Corin. 15.1-3, Paul does not here quite say he got this account from God. Instead he merely says he “received” it. Without saying where. The passage is open to the reading that he received it as many did, 1) perhaps from God – or 2) perhaps from unreliable oral rumors. So clearly the Bible – even the apostles themselves – were conflicted on many subjects, like the subject of resurrection. No doubt the churches were soon enough conflicted about the relative authority of different religious theories about such subjects. Clearly too the two major theories of resurrection, were 1) literal, physical resurrection of the physical body. Conflicting with 2) a metaphorical/spiritual reading of it. Clearly too: the parties that supported spiritualizing this – and everything – in religion, included writers from Plato, like Philo and Origin; the Gnostics; spiritual priests; and specifically the Marcion school. So how did it all finally come down, in the final edit? Eventually the Church and its document, The Bible, decided to try to waffle between these two conflicting theologies: literalism and spirituality. To be sure it outlawed extreme Marcionism. However, it allowed a watered-down version to continue in the Bible itself. Finally the New Testament in effect presents a continuing debate between these two conflicting theologies. And it does not itself, firmly decide between one or the other. Though it will not quite allow either version to triumph. In any pure or extreme form. In the end it considers both views. But overall the NT is neither entirely literalist, nor entirely spiritual or Marcionist. Finally that’s the best final, takeaway message: none of our holy men were ever very reliable, after all. Their writings were always conflicted and indecisive. Much appreciation for your efforts @Roger Parvus. Roger, did the Marcionites never allude to the soon coming of Jesus? It seems like the imminent appearance of the human Jesus is the main motive for the whole NT. Scholars are practically unanimous that belief in the imminent appearance of the Jesus Christ was extremely important to first-century Christianity, and I think that was true both for Simon/Paul’s churches and for the community behind the book of Revelation. But I would hesitate to describe this as belief in the imminent appearance “of the human Jesus.” Although the Revelation community may have believed that Christ had become human when he previously descended for crucifixion, I doubt that Simon/Paul believed that. The proto-orthodox said Simon taught that the Son had only appeared to be a man, and had only appeared to suffer in Judaea. And I think there was another important difference in the end-time beliefs of both communities. The Revelation community thought that when Christ did appear, he was going to establish a kingdom of God on earth. In contrast, Simon/Paul believed that Christ, at his parousia, was going to gather the faithful and bring them to heaven. This world was going to be destroyed. You ask about the Marcionites. As far as I know, they believed in a future parousia of Christ. But they, of course, were second-century Christians, and so I expect that they did not have the red-hot expectation that characterized the original Christians. I have removed a comment from here because it conflicts with the expectations set out in our Comments and Moderation statement, in particular “New Rules #4 and #5”. In what sense was “Simon of Samaria” a “Samaritan”? – purely a geographic designation? – something to do with “denying the prophets” (or scripture other than the Pentateuch)? – an insinuation/intimation of Persian/Magian/Zoroastrian influence? – a later proto-orthodox slur of some kind? I think that in Simon’s case “Samaritan” is at least a geographic designation, though there is no agreement about where Gitta (his alleged Samarian birthplace) was located. Did he also belong to the Samaritan ethnic group? Not necessarily, since there were significant numbers of Gentiles in some of the cities of Samaria. But if, per my hypothesis, the original author of some of the Pauline letters was Simon, I think it quite plausible that he could have been ethnically Samaritan too. That wouldn’t really tell us a whole lot, for scholars still debate about how religiously uniform the ethnic Samaritans were, and how religiously similar or different they were from the Jews in the first-century. There may have well have been the same religious diversity among first-century Samaritans as there was among first-century Jews. I don’t know if we can even safely say that all Samaritans (in the religious sense) only accepted the Pentateuch as Scripture. As for his “Samaritan” tag being “a proto-orthodox slur of some kind,” I don’t think that is likely. In the writings of the earliest proto-orthodox heresy-hunters, practically none of their criticism of Simon is has to do with his being a Samaritan or holding Samaritan beliefs. And they don’t connect his “magic” to his being a Samaritan. Most often they claim he learned his magic in Egypt. I don’t think the proto-orthodox interpolator of the letters was hung up on any one particular explanation. What was important was that any explanation employed had to acknowledge the one true God as the author of the Law. And this means it also had in one way or another to acknowledge that all the precepts of the Law were just, and to harshly condemn as sins all violations of the Law’s moral precepts. Now if Paul was Simon, he did not view the Law as being of divine origin. He believed it was made by the world-making angels, and their aim was to enslave mankind. These angels, having fashioned the corruptible bodies that the spirits of men inhabit, at some point imposed a Law that was largely about material things like foreskins, foods to avoid, rituals to observe, bloody sacrifices to offer, etc. As Simon/Paul saw it, it was these angels who were largely responsible for the wretched and sinful condition of the world they made. I doubt he went as far as to deny that each man bore some responsibility for his own moral conduct, but I think he basically saw the game as so heavily stacked against men that it was the world-makers who were by far the real villains. Christ came and, by tricking the villains into unwittingly committing lese-majeste against him, initiated the destruction of them, their law, and their world. By faith men can know this and, freed from the tyranny of the world-makers, they should begin to live lives that reflect the spiritual creatures they are. By their spirits men are united to Christ. Their spirits are in some way an extension of his. So while waiting for the complete destruction of this world, they should bring forth the fruits of the Spirit. Roger, don’t you think the line in Gal about the Law being given by angels thru an intermediary is a relic of the original thinking about those legislating demons, and that the release soteriology was about escaping their hold on humanity? The two go together. I expected you to say the release theory was there prior to the orthodox interpolator. I’m missing your point. I *do* think the release-from-the-stoicheia theory was in the original letters. And I thought that was what you meant by calling it a “relic.” As I see it, the proto-orthodox interpolator allowed it to remain in the text but successfully rendered it harmless by putting his own explanations (e.g., substitutionary and participatory justification) alongside. The explanations he inserted all operate on the premise that the Law was given by God and that all violations of it were to be taken seriously as being sins committed against Him. To this day mainstream scholars continue to try to harmonize all the soteriologies in the Pauline letters and the usual result is that either an orthodox interpretation is forced on Paul’s words regarding the stoicheia, or it is said the words don’t really represent Paul’s thought since he wrote them in anger. OK. Agreed. Looking forward to the next installments of your work, as ever. There are historicist scholars of Paul, among those who prefer to harmonize between them the various zig zag of the epistles, which are better for you than others in this list? If so, which ones in particular have more influenced you in your view or you’ve still enjoyed? I remember well your view about James and John in Galatians (John being John the Baptist and James his brother). In Acts there is something very strange. Acts 12.1-3 describes the death of James the Pillar. But later in Acts 15 there is another James with the function of Pillar. Who is this other James? Is he the same brother of John of Acts 12:1? Or he is a different James from that killed James (James son of Alpheus?)? Why ‘Luke’ appear do a so big mistake in chronology? If reverse that chronology about all occurrences on James in Acts, the outcome is more near to historical fact (like described in Galatians)? When we arrived at Jerusalem, the brothers and sisters received us warmly. The next day Paul and the rest of us went to see James, and all the elders were present. for which before Paul sees all the apostles (or Peter for all them) and after, in a second moment, or ”the next day” like says Acts, he sees James (not an apostle like others). If I understand correctly, you are proposing that the author of Acts may not have considered the James of Acts 21:18 to belong to the “brothers” mentioned in Acts 21:17. But I’m not sure what meaning you have in mind for the word “brothers” here. Are you taking “brothers” in Acts 21:17 to simply mean (a) Christians? Or (b) a group of Christians distinguished in some way from regular Christians? If the latter, are you taking the group to also be (c) related by blood? Or (d) only bound together by some non-blood tie? the author of Acts may not have considered the James of Acts 21:18 to belong to the “brothers” mentioned in Acts 21:17.
exactly. Like if the author of Acts intends distinguish from all the other brothers and sisters (obviously, generic Christians, apostles or not), that James that Paul meets ”the next day”, and this remembers somehow the situation from Galatians 1.19 (where a distinction is made, too, between apostles and James). Then I wonder if the author has reversed deliberately the chronological order of Galatians: in the epistle Paul meets Peter, after James (Gal 1), then there is the ‘council’ of Jerusalem (Gal 2). In Acts there is before the ‘council’ (after the Paul’s conversion) and after the meeting between Paul and James (Acts 21.17). Okay. I think I get what you are saying. What confused me was the reference you made to Richard Carrier in your previous comment. Carrier says the words “but another of the apostles I did not see, except James, the brother of the Lord” could mean that the James in question was not an apostle: “By calling him a brother of the Lord instead of an apostle, Paul is thus distinguishing this James from any apostles of the same name…” (On the Historicity of Jesus, p. 589). So I thought you were trying to make a similar distinction between the “brothers” (i.e., Christians) of Acts 21:17 and the James that Paul meets “on the following day” (Acts 21:18). I now realize that you are calling attention to a similarity in sequence. As you say, in Galatians 1:19 the occasion when Paul “saw” (whatever that means) James took place sometime *before* the so-called council of Galatians 2, whereas in Acts there is a meeting between Paul and James at some point *after* the council. Did the author do a deliberate reversal? Perhaps but, as you know, many consider Acts to be historical fiction and think its author felt quite free to rework and create events for his own purposes. The same should be kept in mind when assessing his claim that there was an apostle James, brother of John, who was put to death by Herod in the 40s. As to why the author would have fabricated that particular incident, your guess is as good as mine. You can see from the fifth post in this series that I doubt there was any “council of Jerusalem.” I think the one that is in Galatians is likely the creative work of the proto-orthodox interpolator. It was his way bringing his new Paul and the Jerusalem church into harmony. The author of Acts appears to have liked the basic idea of such a council, but created his own significantly different version of it. I agree (a bit sorry because Acts is very frustrating in this sense, but that book is very useless). Do you agree with the arguments in OHJ about ”the brother of Lord”? I am very impressed, because it explains very well why Paul swears even upon God in Gal 1.22, among the other things. Yes, he makes a very good case. But I haven’t yet ruled out another possibility: that the Jerusalem church had been founded by someone (not a human Jesus) who was called “lord” by the rank and file members. One reason is that in the two letters that precede the Pseudo-Clementine Homilies a James is addressed as “the lord and bishop of the holy church” and “the lord and the bishop of bishops.” The James in Gal. 1:19 could be the biological brother of the human lord who founded the Jerusalem church. I understand. You can suppose the kyrios ( in Gal 1.19) is the same John the Baptist because you assume that Gal 2 is interpolation where it mentions John at the ‘council’ as Pillar, in relation of total peace and harmony with a seeming rebel Paul. But if a violent conflict have to exploit (according your view) between Paul/Simon and the Pillars, it can as well start from Gal 2.14, where it seems as if the original epistle had some embarassing description of aggressive reaction of Peter against a more direct Paul finally without the mask, a description that a later interpolator omitted. Bluntly Gal 2.15 starts with only theological points and continues so until the end, lacking any mention of that imminent conflict at Antiochia that Paul had any reason and interest to describe to his Galatians (but a proto-othodox interpolator evidently no). Peter seems not to have been a leader of any group, but rather more of a public relations figure. Peter seems to have been a high level person who interacted with others, such as Paul, more than James because James was the head of the group. The result being that Paul had more contact and interaction with Peter, even though Peter was not as high-level of a figure as James. This role of ambassador of Peter is corroborated in Mark 8:33, where Jesus rebukes Peter but *sees* the other 11 disciples (then showing Peter is only their intermediary – not their superior -, a Petrine role that Mark takes from epistles of Paul). The meaning of that ”seeing the 12 and not Peter into the eyes” is for me a thin link to previous episode. Peter is assumed later the founder because his name, but that is the correction by Matthew of a similar sarcastic point in Mark regard the origin of name ‘Peter’. the episode 3 of Acts is similar, if I’m right, to episode 1 of Galatians, in virtue of same way of meeting (before the apostles, after James). James cannot die in Acts 12.2 and return alive after. Then the author of Acts has reversed the true order, maybe in order to dissociate the death of James (episode 1, assent in Galatians) from the episode 3 (council followed from an anti-Paul riot and Roman repression) and episode 2 (Antiochia incident). Thus Acts 21.17-18 (episode 3) describes the episode 1 of Galatians (with similar terms) and merges it with the council of Jerusalem (while in Galatians that happened after 14 years). In Galatians the Antiochia incident is next to council, but in Acts it’s before the council. I suspect that there is a link of cause-effect between the Antiochia incident and the death of James, which, if Story and not fiction, may only happen after the episode 3 of Galatians. I see another curious fact from Gospel of Mark. In this Gospel, all the historical characters that went fictionalized into the story are opponents of Pauline Gospel in a way or the other. I mean, Pilate, Caiphas, Erode and son, Salome, did exist (via Josephus) but for the Gospel are all persecutors of Christ and/or Christians. John the Baptist existed (via Josephus) but he or his sect, too, was enemy or at most neutral or indipendent or simply rival to Pauline Christians like Mark. Peter, John and James ”the sons of Zebedee” are historical men (via Paul) although were fictionalized, and they all were Christian opponents of historical Paul into the History. Any other character in Mark (all pro Mark’ Jesus) is pure fiction, never existed. I wonder if this is sign of total fiction: the author is interested to the ‘history’ to the extent that he wants to criticize by it negative aspect of rival contemporary people, and invents characters ex novo to the extent that serve to build his positive point. But it’s more strange that Matthew corrects Mark about who is good Christian and who isn’t, rehabilitating the Pillars and Peter, but never showing in virtue of this a more strict sincerely direct link or info with or about them, not insofar Mark is strongly linked to Paul even if he is never explicitly mentioned in Mark. Then I am indebted to Roger’ suspicion that the author of Matthew pretended to be faithful to the historical Pillars but it was Proto-orthodox in reality. Roger, If the oracles of ur-Revelation were around at the time of Simon and were so influential that Simon needed to respond to them and the later interpolator felt the need to defend, then why is it that Revelation barely made it into the orthodox canon? I always assumed that latter fact meant that Revelation never had much of a fan base in the early church, but you are suggesting otherwise. The first proto-orthodox opposition to Revelation seems to have arisen at the beginning of the third century. I am not aware of any proto-orthodox writers who opposed it before then. Justin used and approved it, as did Irenaeus, Clement of Alexandria, and Tertullian. It is listed in the Muratorian canon which is usually dated end second century.